Samantha's Bookshelf: What's Up Wednesday! Wow, it's been a while since I did one of these! 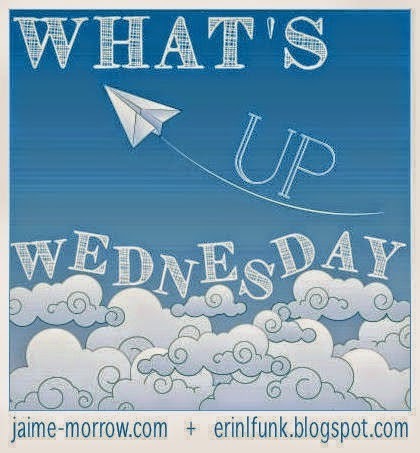 What's Up Wednesday is a blog hop created by Jaime and Erin to help writers keep in touch with each other. A week ago I completely gutted my WIP that I've been working on for a year and a half and pretty much started again. I kept the bones of the original wip but it needed a total make over so hopefully this will make it much better! My photos from my travels. I had so many great ideas for new stories while I was travelling and so many of them are held within the thousands of photos I took. I honestly get lost in them every time I start looking through them. The life that many Africans live is somewhat similar to the life of my central character in my WIP (yet also very different), so I was able to really gain a lot of insight and inspiration from that. That and the gloomy London weather! (Summer, what summer?) A rainy day is always conductive for inspiration! I just read your "I'm back" post and those photos look awesome. You've had quite an adventure over the past 9 months, and you really should write about it on the blog. :) I'm glad your writing has benefited from travel and the time away. Thanks Colin! Perhaps I will write a post about it at some point :) It's really nice to be back! Welcome back! It's nice to meet you. Good luck getting back into the swing of things! It sounds like it was time well spent. Good luck learning guitar ^_^ I love playing music. Sometimes stripping a WiP down and rewriting it from the ground up is the best thing you can do. Hope it works out well for you. Thank you! Me too, music is the best! I agree, I think it's the right thing to do. It's just a little frustrating at times! Just read your "I'm Back" post too, and wow! So many awesome photos and so much travelling! Very, very cool. :-) I think it's nice to come back and take a look with fresh eyes at something you've been writing. I know it always helps me a lot. I'm currently doing a rewrite on one of my own stories, so I'm right there with you! Hah yeah, it was just the fact that I knew my book was kind of crap and it needed a lot of work. Now I know I have a really solid story (i'm changing a really key part which is making it work much better) so I think this time around it'll be much happier I guess you could say! Good luck remaking over your WIP. I have an old MS that I want to do that to someday... just letting it sit for awhile though while I work on other stuff first. I'm hoping by the time I go back to it, I'll be *able* to write it better. I'm sure you will. I had a good four months away from my WIP and it really helped :) Good luck!! Just read your 'I'm Back' post, all that travelling looks like it was so much fun! :o I'm especially jealous of that trek through Africa, that must have been amazing. Oh it was, Africa was an incredible experience! I'd go back in a heartbeat! I agree, it's sad letting go of the first draft and starting over but I'm sure it'll be worth it in the end! I just checked Ruby Red out of the library, half on accident. I'm not sure it's exactly the kind of book I'm in the mood for right now, so I'm glad to here that you enjoy them. Maybe I'll give it a try.